This story updates "El Nino-Induced Drought in Zimbabwe" published on April 29, 2016. HARARE, Mar 3 2017 (IPS) - Dairai Churu, 53, sits with his chin cupped in his palms next to mounds of rubble from his destroyed makeshift home in the Caledonia informal settlement approximately 30 kilometers east of Harare, thanks to the floods that have inundated Zimbabwe since the end of last year. Churu’s tragedy seems unending. From 2015 to mid-2016, the El Nino-induced drought also hit him hard, rendering his entire family hungry. “I farm here. I have always planted maize here. All my crops in 2015 were wiped out by the El Nino heat and this year came the floods, which also suffocated all my maize and it means another drought for me and my family,” Churu told IPS. Churu, his wife and four children now share a plastic tent which they erected after their makeshift three-room home was destroyed by the floods in February this year. “We are homeless, we are hungry. I don’t know what else to say,” Churu said. Zimbabwe has not been spared the severe droughts and floods triggered by one of the strongest El Niño weather events ever recorded in the country’s history, which have left nearly 100 million people in Southern Africa, Asia and Latin America facing food and water shortages and vulnerable to diseases, including the Zika virus, according to UN bodies and international aid agencies. With drought amidst the floods across many parts of this Southern African nation, the Poverty Reduction Forum Trust (PRFT) has been on record in the media here saying most Zimbabwean urban residents are relying on urban agriculture for sustenance owing to poverty. PRFT is a civil society organisation that brings together non-governmental organisations, government, the private sector and academics here in Zimbabwe to discuss poverty issues and advocate for pro-poor policies. Even government has been jittery as floods rocked the entire nation. “Not all people are going to harvest enough this year. The floods have come with their own effects, drowning crops that many had planted and anticipated bumper harvests. Some greater part of the population here will certainly need food aid as they already face hunger,” a senior government official in Zimbabwe’s Agriculture Ministry told IPS on condition of anonymity for professional reasons. For the mounting floods here, experts have also piled the blame on the after-effects of the El Nino weather phenomenon. “El Niño conditions, which are a result of a natural warming of Pacific Ocean waters, lead to droughts, floods and more frequent cyclones across the world every few years. This year’s floods, which are a direct effect of the El Nino weather, are the worst in 35 years and are now even worsening and bearing impacts on farming, health and livelihoods in developing countries like Zimbabwe,” Eldred Nhemachema, a meteorological expert based in the Zimbabwean capital Harare, told IPS. Consequently, this Southern African nation this year declared a national emergency, as harvests here face devastation from the floods resulting in soaring food prices countrywide, according to the UN World Food Programme. The UN-WFP has also been on record reporting that Zimbabwe’s staple maize crop of 742,000 tonnes is down 53 percent from 2014-15, according to data from the Southern African Development Community. The floods have prompted Zimbabwe’s Ministry of Environment, Water and Climate to recommend that a state of disaster be declared in the country’s southern provinces, where one person was killed by the floods while hundreds were marooned by raging rivers that swept away homes and animals. For instance, this year’s floods in Zimbabwe’s Masvingo Province left 300 pupils marooned at Lundi High School, leaving mostly girls stranded after the Runde River burst its banks and flooded dormitories. 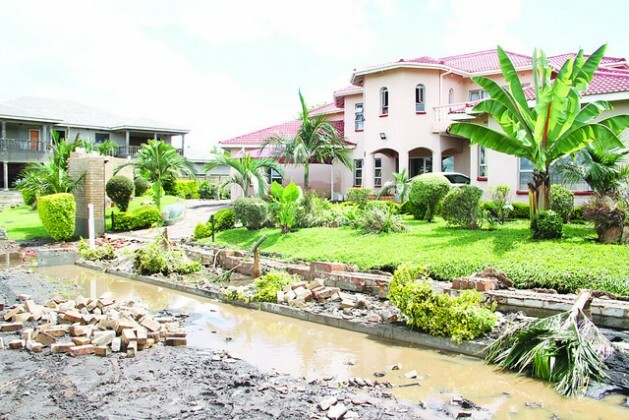 About 100 homesteads were also hit by the floods in the country’s Chivi, Bulilima and Mberengwa districts, according to the country’s Civil Protection Unit. Based on this year’s February update from the country’s Department of Civil Protection, at least 117 people died since the beginning of the rainy season in October last year. And for many Zimbabweans like Churu, who were earlier hit by the El Nino-induced drought, it is now double trouble. “We already have no crops surviving thanks to the floods, yet we have had our crops destroyed by El Nino the previous year, and so suffering continues for us, with drought in the midst of floods. It hurts,” Churu said.